Summer will be here before you know it. Vacation plans are already being made to luxury destinations around the world. Once again Greece is a hotspot for travelers. As a result, maybe it’s finally the time for you to experience this fabulous country. Just in time for booking your summer getaway to Greek Islands, THE LUXURIANS Greek Icon Villas is proud to present you 12 of its best private pools from its Lux Villa Collection. Cool off on a hot summer day. Temperatures tend to get really high and the soft breeze caresses your sun-kissed skin. It really feels fantastic. There’s no feeling that’s more alluring than a dive in your own private pool. Pack your bags and soak up the Greek summer vibe! In addition, throw in a cool afternoon drink and incredible sunsets. Now you may have just found your paradise on earth! Enjoy the many amazing private pools in Greece. It’s time to forget about your swimwear. Simply take a breath and dive on in. Relax and joy the best life has to offer. It’s a VIP experience you deserve. Just in time for booking your summer getaway to Greek Islands, we are proud to present you 12 of the best private pools from the Lux Villa Collection. Therefore, from Mykonos to Syros and from Paros to Antiparos these luxurious private pools are worth booking a plane ticket for. So grab your passport and fly away to that perfect vacation in magical Greece. It’s our pleasure to share 12 luxury villas in Greece that all offer incredible, private pools. Situated on one of Syros most alluring locations, villa Scarlett raises the concept of elegant island living to a crescendo. Following the summer breeze, you will find the mind-blowing outdoor space. Relish the superb views of the Aegean Sea stretching out directly in front of you. Tucked into a vast plot of land, located in Ambelas area in Paros, The villa is just minutes away from the much sought after Naoussa. Norma is a beautiful, brand new villa that offers seclusion and tranquility. From generous spirited outdoor areas and high-quality interiors to a private path leading down to the sea. Villa Levantes is a place of laid-back luxury, blessed by breathtaking sea views. This modern bohemian villa is located in Agios Stefanos, one of the most privileged areas of the island. Relax and enjoy fabulous views of Mykonos town and the Aegean Sea. Set on a cliff, in a secluded land plot, just over a small river, surrounded by rocks of extremely natural beauty and shapes. This residence offers a stylish and tranquil retreat from which you can enjoy the unimpeded views to the classiest beach of Mykonos, the Agrari beach. Just a five minute walk from the famous Kolybithres beach and five minute drive from the village of Naoussa. As a result, this spectacular 7-bedroom villa commands sweeping views from its elevated position. Splendidly situated on a hilltop above Agios Stefanos Bay in Troulos, Agatha offers a stylish retreat from which you can enjoy breathtaking sunsets over the Aegean. Embrace unimpeded views to Delos and the picturesque town of Mykonos. The eye of the passerby will have a hard time distinguishing it. This luxury villa is perched high up between the viv­id outlines of the imposing cliffs. But guests will easily distinguish it when comparing its rare loca­tion and its extraordinary view. It provides both luxury and a unique style compared to any other villa in the area. 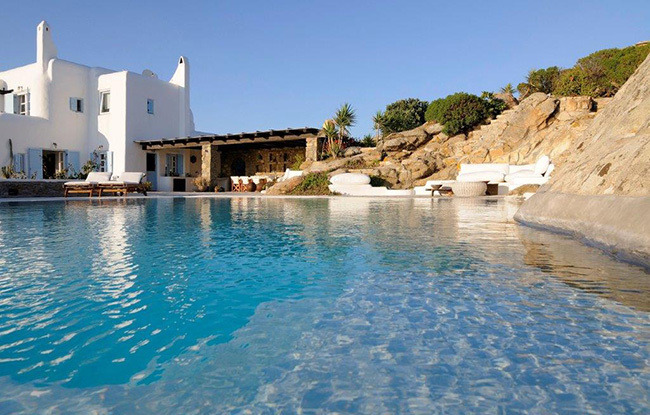 Carmela is a luxurious property situated in Psaralyki only two minutes away by car from the town of Antiparos. You’ll find an Enetic fortress and numerous white washed houses. From its dominant position, the house offers uninterrupted views of the Aegean and the neighboring islands. Breathtaking, majestic and mystical are just a few words to describe villa Morgana. This exquisite villa is nestled just steps away from a secluded pebble beach with amazing sea and sunset views. Joe is an elegant retreat built with respect to the distinctive architecture of the island of Syros. Its supreme hill top location with the incredible panoramic views over the bay of Tria Lagonia. As a result, it is a magnet for those looking for making the most out of the serenity and calmness of the place. This villa is situated on an elevated position facing the town of Mykonos and the old harbor. Villa Swann relishes astonishing views of the sea while, lines of the Cycladic islands of Tinos, Delos and Syros mark the horizon. Our personal and corporate concierge services programs have all been carefully designed to enhance your specific luxury lifestyle. The Life of Luxury can provide luxury concierge services and VIP access in over 115 countries around the world. What are you waiting for? Get immersed in Greek culture and enjoy a luxury getaway to Greece and stay in a luxury villa. Unwind in one of the many private pools we feature in this luxury blog article.